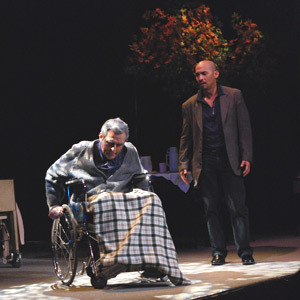 Prof. Morrie Schwartz (Miguel Faustmann, in wheelchair) teaches Mitch Albom (Bart Guingona) to slow down and appreciate what he has in his life. Watch the ailing professor impart his wisdom for his student in the book-turned-stage play Tuesdays with Morrie. It will be performed on December 2 at Greenbelt 1, Makati City. The surprise hit that took theater audiences across the country by storm is coming back "home" to where it began its journey. For one single Tuesday this December, Tuesdays with Morrie can once again be seen on the stage where it was first performed this January. Nearly 11 months after its Philippine premiere, the play that has been eliciting laughter, tears and thunderous ovations from audiences in Luzon, the Visayas and Mindanao will make a comeback to Onstage Greenbelt for one night only. Bart Guingona, who plays Mitch Albom opposite Miguel Faustmann's Morrie Schwartz laughingly says, " Who'd've thought anyone would be interested in something as patently unsexy as a middle aged man and an old man exchanging ideas about life, love and death?" But here they are, successful beyond their wildest expectations, drawing crowds of seasoned theatergoers and novices along the way. When the play opened for an initial run of 12 performances in January, little did anyone know that it was going to have a long fruitful run ahead of it. After it closed in Metro Manila, Tuesdays with Morrie had six shows in Cebu, packing in a 1,100 seater each time. It then moved to performances in Pampanga, Alabang, Dumaguete, then back to Makati, Cagayan de Oro, and most recently Alabang once more. What Guingona had not counted upon was that the book had enough of a "brand name" to give the play a measure of pre-publicity. That plus its down-to-earth, unabashed bid for spirituality made it the dark horse theater hit in a theatrical season of spectacle and satire. Baby Barredo's spare direction, the minimalist impressionistic "set" and Monino Duque's evocative yet unobtrusive lighting quite apart from the performances of the two stars, have been praised by critics and audiences alike. Miguel Faustmann plays Prof. Morrie Schwatrz whose unfailing sense of humor in the face of adversity bring a lightness and lovability to the proceedings. It is a performance that lifts the play from pathos and makes Morrie both tender and strong, a lovable and loving mentor. Playing the harried sportswriter Mitchel Albom, Bart Guingona gets to explore his own acting range as he transforms from cold and unfeeling to warm and loving. The bestselling book by Mitch Albom was turned into a TV movie by Oprah Winfrey after she had selected it for her reading club. It was subsequently adapted for the stage and has been performed in various productions around the world. Tuesdays with Morrie will be performed at Onstage, Greenbelt 1, Makati City on December 2 (Tuesday) at 8 p.m. Please email repertoryphilippines@gmail.com with the subject "Tuesdays tickets." Interested ticket buyers may also call 8870710 or text 09175378313.